It’s Time… To Cast YOUR Vote! I am commemorating the special announcement below by sharing a first glimpse at Give Me Time Forever III. It is my contribution to the SAQA Best of the West Traveling Trunk Show, that officially starts touring in June 2012. In just one day the “Inspired To Quilt” Online Quilt Expo will be opening their doors for what is shaping up to be a very exciting event for all of us textile/fiber artists and designers. Who would have thought, even just a few years ago, that something like this would be possible? I don’t think our traditional quilt shows are going to go anywhere anytime soon, but being able to meet up with quilters from all around the world; getting to participate in all of the presentations, demonstrations and being able to (virtually) stroll through the quilt exhibits and vendor booths…right from our homes??? That’s just too cool! And after your visit come back and leave a comment to share with other readers. I really appreciate your continued support and look forward to your feedback! I sincerely hope to see you all at the virtual quilt show from March 7th to 10th! 06 Mar	This entry was published on March 6, 2012 at 6:17 am. It’s filed under Art, Creativity Update, Design, Special event, Virtual Quilt Show and tagged Best of the West Traveling Trunk Show, cast your vote, Give me Time Forever III, limited time to participate, Most Inspiring Quilt Teacher for 2011, Nomination for most inspiring quilter of the year, SAQA, virtual quilt show, Willowbend Creations. Bookmark the permalink. Follow any comments here with the RSS feed for this post. This sounds great but …I am somewhat leery of signing up for things on the web. Will this mean I will constantly get mailings trying to entice me to buy quilt related things ? Joyce, I am under the impression that the online quilt expo is a limited engagement for the next four days. If you receive any other notices after that there should be an unsubscribe option with every email. Sign up is free and if you decide you don’t enjoy the event you can quickly unsubscribe. Hope this helps! I’ve spread the word on my blog for you, Anna! Marg, thanks for your continued support! Janna, die Austellung ist auf dem Internet! Da kannst Du auf dem Link clicken und Dich registrieren. Das is alles ohne Kosten fuer Dich. Versuche es mal! Just registered and can’t wait to check out the online expo! And what a beautiful piece. 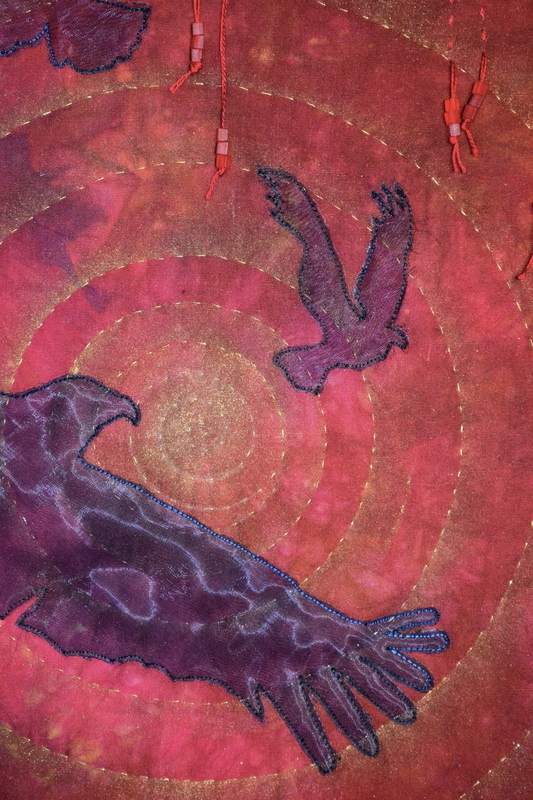 I’m working on some collage pieces with soaring eagles… this makes me want to get them finished.